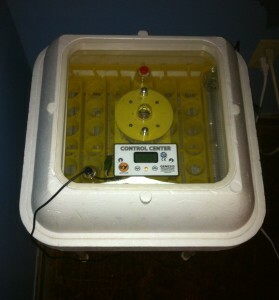 We use the Genesis 1588 Hova-Bator to incubate and hatch our chickens and ducks for our homestead. The incubator comes with a very informative instruction manual that explains the set up and operation of the incubator. This post will give anyone interested in purchasing an incubator (specifically the 1588 Hova-Bator) a good understanding of the basics of the process. In 2013 we hatched one batch of chickens in the spring and one in the fall using the Hova-Bator with very good success. The information will be a based on our experience using the incubator based on the instructions provided and thePermaculture Chicken: Incubation Handbook by Anna Hess. First you must start collecting your eggs. We usually start collecting eggs on a Monday and, depending on how many chicks we hope to hatch, collect eggs until we have enough. Seven days would be the most days I would collect eggs for. As your eggs get older their hatch decreases. We have a small flock so it usually takes us about 7 days to collect our eggs. We usually try for 30 or so. During the collection time, we store the eggs in our basement in egg cartons. The area should be cool (55-68 degrees) and out of direct sunlight. Avoid touching the eggs as much as possible. Keep the eggs moving to avoid the embryo sticking to the shell. This can be accomplished by propping one end of the egg carton up with a piece of wood and then switching the end at least once a day. The 1588 Hova-Bator (and most other incubator) come with detailed step by step instructions on how to setup, operate, and maintain your incubator. Chickens take 21 days to hatch so on the day you add your eggs to the incubator, count ahead 21 days and mark your calendar. One day 18 you will want to remove your eggs from the egg turner, lay them on the wire floor of your incubator spacing them out as much as possible and wait for them to start hatching. During the first 18 days the incubator and egg turner do almost all the work. It is highly advisable to purchase an egg turner. If not you must be the egg turner and turn the eggs 2 or 3 times per day. In the meantime monitor the temperature and humidity each day. The temperature should be around 100 degrees F and humidity should be around 45 – 55% during setting. Pay close attention to the humidity for the first couple of days. If humidity is too high at first you can remove the plug or slightly prop open the incubator top to lower the humidity. After a couple of days I try to eventually close the top and put the plug back in place. Once or twice a week you will need to add more water to the trough in the plastic liner in the bottom of the incubator. Most have multiple troughs, one for setting and usually you fill both or another trough during hatching to increase the humidity. Once you remove your eggs from the egg turner increase the humidity as described above. Try to keep the humidity level at 55 – 65% during the next 3 or 4 days. Increasing the humidity and keeping it at the correct level is important during hatching in that it keeps the eggs natural moisture inside the egg from drying out. This makes hatching more difficult for the chick. This is also a good time to get your brooder set up. On day 21 if everything goes right, the chicks should start hatching. As they hatch (which will be at different rates) they will need time in the incubator to dry. Avoid opening the incubator during this time except to remove chicks. Some instructions say to wait until all chicks have hatched before opening and removing the chicks. We usually remove them 3-5 at a time. My experience has been that if you leave the chicks in the incubator too long they will roll and knock the other unhatched eggs all around the incubator. We are currently 3 days into our spring chicken egg incubation. We collected 32 eggs for incubation hoping to get at least 20 or so birds to butcher as our meat chickens. We will select up to 10 hens from this hatch to replace our current laying flock in the fall. I’ll follow up on the results of our hatch later this month.